Hello, I’m Hannah Brine and I’m so pleased to be launching this choir in Finsbury Park. I have founded and conduct other choirs including Kensington Singers and Victoria Park Singers, having moved down from Leicester where I established Fosse Singers, back in 2007. I was extremely honoured in 2015 to be named a BBC Unsung Hero for my work with community choirs, as its something I really love to do. I teach singing and have lead school choirs and in autumn 2017 I joined the singing faculty teaching at Mountview Academy of Theatre Arts. In 2011 & 2013 I studied with the Association of British Choral Conductors and in 2014 I received my LRSM in musical directing with a distinction. You can read more about my work here. 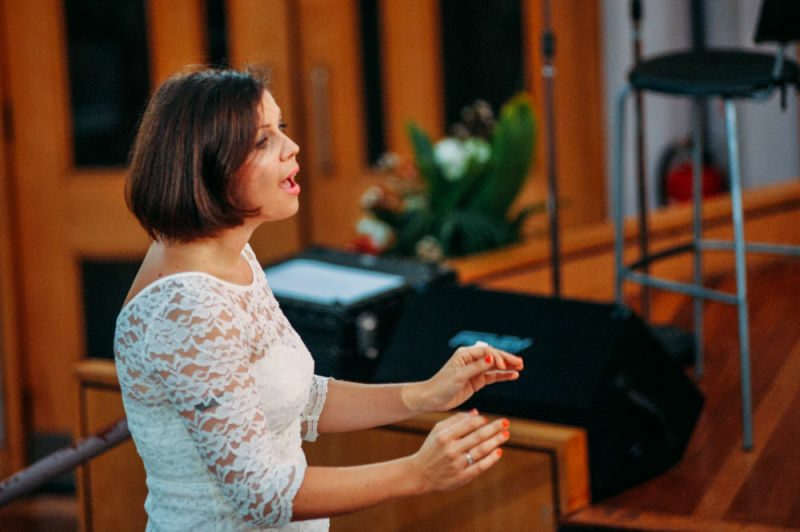 I conduct corporate choirs and workshops and have also delivered choral projects for ITV, Engine Advertising, the NHS, Metro Bank, Fremantle Media, Parkinson’s Society, UK Green Buildings Council, Selfridges, De Montfort University, Royal Brompton Hospital, Jones Day law firm & Shoreditch House. I love all styles of music from classical to pop and aside from conducting I have recorded sessions for Disney and performed at venues including the Barbican with Wynton Marsalis, NEC, Birmingham Symphony Hall, various jazz festivals and on released dance and chill out tracks including on Armada Music, Black Hole, Café Del Mar and Buddha Bar. I fixed and coached the choirs for Gary Barlow’s performance at the 2016 Royal Variety Show and the 2017 Olivier Awards, where members of Kensington Singers took part, and I performed with Gary as part of the choir on Strictly Come Dancing in 2016. I also write songs and do sessions – both of which can be interesting and unusual! I am most excited by a cappella, jazz, world, folk and experimental vocal music. Passionate about working with singers from all backgrounds and creating a supportive learning environment, I look forward to welcoming you to Finsbury Park Singers.